Kensington and Talmadge are both neighborhoods in the mid-city region of the city of San Diego California. The Kensington-Talmadge Planning Group advises the city in land use, project development, infrastructure and community character matters for the neighborhoods. Talmadge and Kensington are both historic neighborhoods with histories that date back to the early 1900s. Talmadge is rather eclectic architecturally and contains California bungalows alongside Cape Cod cottages and Spanish revival structures and Kensington is home to an impressive number of Spanish Revival style homes which were popular in the city in the 1920s. The neighborhoods are pedestrian friendly and have a warm welcoming atmosphere that newcomers truly appreciate. The borders of the neighborhood of Talmadge are generally accepted as Fairmount Avenue to the west, El Cajon boulevard to the south and on the northeast edge Montezuma Road/Collwood Boulevard. The neighborhood is named for the Talmadge Sisters, film stars of the 1920s, In 1927 the sisters started the Talmadge Park real estate development. Today, streets in the neighborhood still bear the names of the beloved sisters. The neighborhood is known for quiet streets, tranquil canyons and beautiful, eclectic historic homes. These neighborhoods have quiet streets and a charm that is often absent in the big city. The neighborhood of Kensington was founded in 1910, and once again it was sisters who owned the land that became this subdivision. Their names were Abby (Hall) Hitchcock and Mary (Hall) Gleason and they inherited the lands from their mother and brother. In the 1910s the neighborhood was connected with other parts of the greater San Diego area by the streetcars of the San Diego public transit system. Many streets in this neighborhood have English place names that lend the neighborhood a British vibe. This neighborhood is known for its small town atmosphere that is supported by neighborhood wide parties like the Memorial Day Parade and the Fourth Of July Block Party/ Street Basketball Tournament. 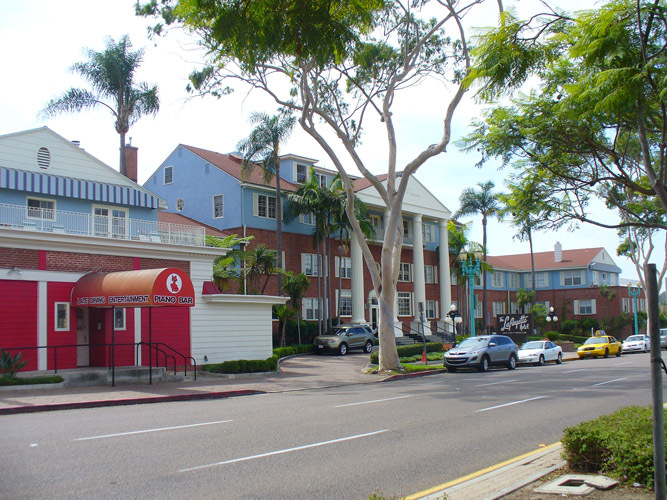 The neighborhoods of Kensington and Talmadge are in the heart of the city of San Diego and are surrounded by countless opportunities for employment, entertainment and education. With parks, museums, galleries and cultural events just down the street. These neighborhoods have quiet streets and a charm that is often absent in the big city. Homes for sale range from small cottages and starter homes up through sprawling historic and luxury homes. Other real estate options include apartments, houses and duplexes for rent as well as town houses and condominiums for sale or lease. Explore all that Kensington and Talmadge have to offer with the help of a friendly local real estate agent and find the home of your dreams today. Learn more about schools near Kensington complete with ratings and contact information.